The Oldest Electric Violin In Active Service? 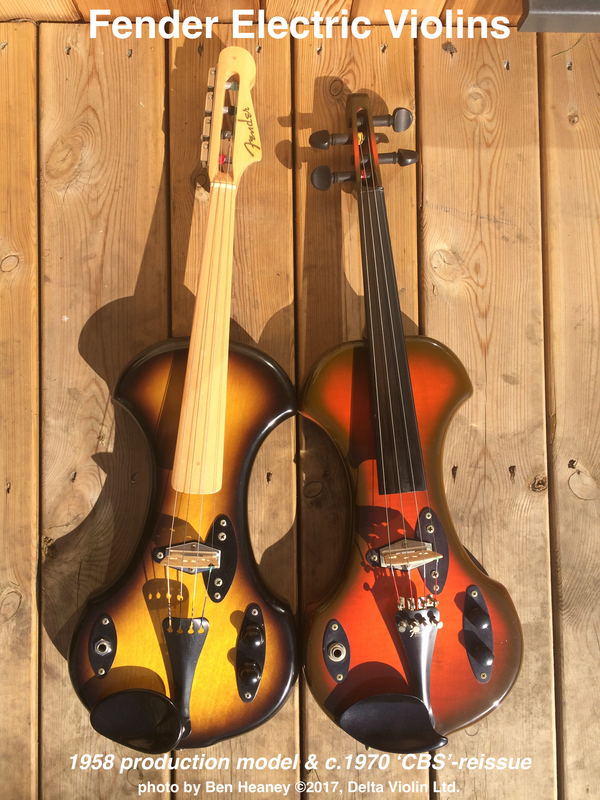 A rare sighting… original electric violins by Fender, now more than half a century old! In the fast-growing field of the electrified bowed string there is now a voice that has been missing for much of the past six decades. Such positive reactions to it raise serious questions prompting a totally new perspective on today’s market. Deltaviolin is proud and excited to be spear-heading the unveiling of this key-stone in the Story of the Electric Violin. Leo Fender, undisputed master of electric musical instrument invention, completed his family of electric stringed instruments by producing a revolutionary new electric violin as early as 1958. Work on it had begun nearly a decade before. In his patent applications for both the violin design and pickup technology he also successfully defined a new term; during the following decades ‘electric violin’ quickly caught on. Violinists, luthiers, composers and audiences took to it as something new and exciting, yet somehow the actual instrument Leo created remained mostly unseen and unheard, virtually unknown. A truly remarkable fact considering the rapid global success of Fender. With maybe no thorough explanation possible, his contribution to the state of the electric violin today has largely been glossed over and mostly not even noticed. But, as his violin is currently finding effective use in the most modern recording studios and working perfectly well on stage, it cannot simply be brushed aside because it was obscure. This is a unique instrument, with a clear powerful voice and an incredible story. Certainly, it is one of the oldest electric violins in active service today, maybe the oldest. However, as a musical instrument, emerging to some possibly as a late comer in an already thriving electrified bowed string scene, it has every bit as much to say as any other electric violin… and more. This electric violin can be heard on an LP by Oxfordshire based group The August List. On 5th May, 2017, they release their hotly anticipated 2nd studio album, ‘Ramshackle Tabernacle’ on Ubiquity Project Records, with one of the songs, `Where Has All The Fire Gone?’ featuring the “amazing” sound of the very first production model Fender electric violin. 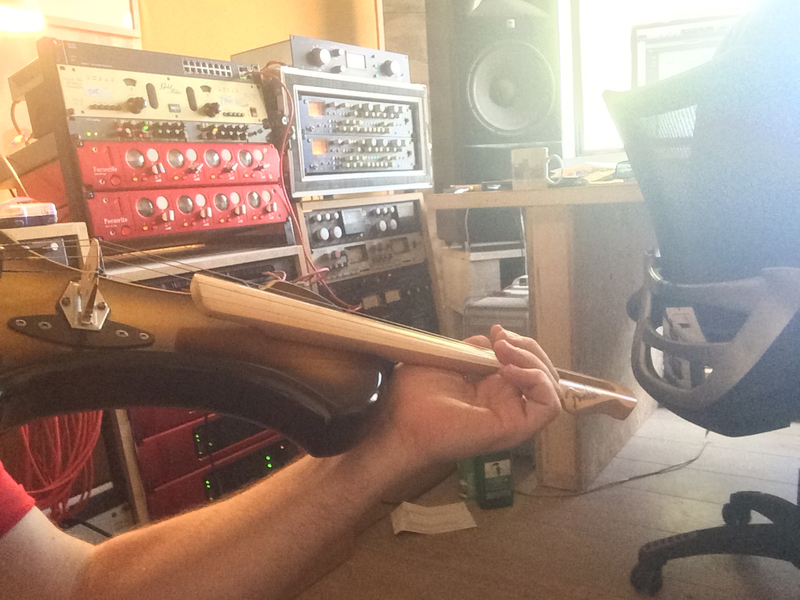 This is thought to be the first commercially available recording ever made of Leo Fender’s electric violin since it left his workbench… Critical judgement has actually not been possible until now! Booked performances of the group are set to include it in the line-up. Following a few low-key live performances and self-published home-recordings over the past two years featuring Leo’s violin, confidence in the instrument is growing. In March 2017, Oxfordshire band, The Great Western Tears took to the stage performing songs from their new album ‘Tallows’ inviting electric violinist Ben Heaney to perform with the band. After the performance, lead singer from The Epstein commented on how beautiful the sound was and local Independent record store owner talked enthusiastically about hearing it there for the first time. These reactions are typical of the feedback given from people, including professional musicians after hearing this ‘old’ electric violin for the first time. Find out more about The August List from their front-page news story in Nightshift Magazine, listen to them via Bandcamp or follow their Facebook feed. Check out The Great Western Tears, follow their Facebook feed for gig info and news of future recordings. More news about a single release from a new artist coming as soon as details can be given!